VARIATION OF MAXILLARY FIRST PREMOLAR WITH THREE ROOT CANALS. Janet Kirilova1 , Snezhanka Topalova-Pirinska1, Dimiter Kirov2. 1) Department of Conservative Dentistry, 2) Department of Prosthetic Dental Medicine, Faculty of Dental Medicine, Medical University- Sofia, Bulgaria. Background: Successful endodontic treatment requires effective biomechanical preparation of the root canals and three-dimensional obturation of the root canal system. This can be achieved only by knowing and identifying the variations in the root canal system of the endodontically treated teeth. The Aim: The aim of this article is to present cases of endodontic treatment of maxillary first premolar with three root canals – different types. Material and Methods: Five clinical cases of successful endodontic treatment of patients with maxillary first premolar and three root canals are described. Result and Discussion: It is noted that good endodontic practice requires good knowledge of dental anatomy and possible variations, accurate X-ray images, as well as use of magnifying equipment. Conclusion: Knowledge of dental anatomy is fundamental for good endodontic practice. Kirilova J, Topalova-Pirinska S, Kirov D. Variation of Maxillary First Premolar with three root canals. J of IMAB. 2014 Jul-Sep;20(3):584-588. doi: http://dx.doi.org/10.5272/jimab.2014203.584. 3. 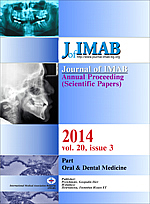 Nica L, Ianes C, Florita Z. Root canal treatment of a three-rooted maxillary first premolar –a case report. Endodontic Practice Today. 2011; 5(1):63-6. 10. Kumar A, Iftekhar H, Andrabi SM. Endodontic management of a three rooted maxillary first premolar. Guindent. 2012; 5(2):32-33. 11. Victorio FR, Men-Martins M. Maxillary first premolar with three roots. Case report. Dental Press Endod. 2013 Jan-Apr; 3(1):73-7. 13. Aggarwal V, Singla M, Miglani S. Evaluation of root canal anatomy of maxillary premolars in an Indian subpopulation using spiral computed tomograthy. ENDO (Long Engl). 2011; 5(2):119-24. 14. Sieraski SM, Taylor GN, Kohn RA. Identification and endodontic management of three-canalled maxillary premolar. J Endod. 1989 Jan;15(1):29-32. [PubMed] [CrossRef]. ].